Fine porcelain maker Royal Worcester has ended production in a city that has been its home for more than 250 years. The last 15 production workers left the Worcester firm's Severn Street factory on Friday. Work has been moved to Stoke-on-Trent and abroad to cut costs. The firm that bore the city's name and the Royal warrant, was founded in 1751 and has made some of the finest porcelain in the world. The old factory is provisionally part of a new redevelopment in Worcester. At its height, the firm employed nearly 1,000 people but changing tastes and cheaper imports have seen that number fall drastically. Only porcelain painters now remain at the site. About 100 staff were made redundant in 2003 and another 100 went in 2005. At the time, management said the redundancies were inevitable due to falling demand for traditional products, and were part of a restructuring of its manufacturing. The site is now in line to be part of the new Waterside redevelopment, which could see up to 400 homes, shops and cafes being built in Worcester. 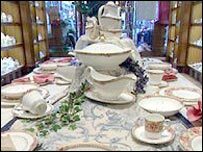 The Royal Worcester and Spode group has operations in Stoke-on-Trent and North America.